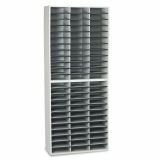 Fellowes Literature Organizer, 72 Letter Sections, 29 x 11 7/8 x 69 1/8, Dove Gray - Literature organizer is perfect for organizing sales literature, mail forms or any other type of letter or printout size document. 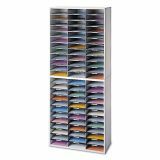 Finish complements any office decor, these organizers are ideal for use in literature rooms, mailrooms, by fax machines, laser printers or any area where documents and forms are stored, created or distributed. 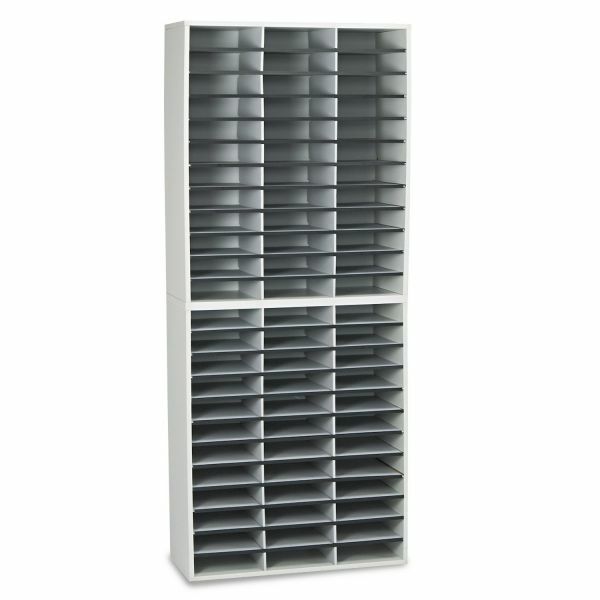 Organizer is made of 5/8" thick melamine laminated wood shell and a 200 lb. test corrugated fiberboard divider system. Includes self-adhesive labels for individual compartment identification. Letter-size compartments measure 9" wide x 11-5/8" deep x 2-1/2" high.